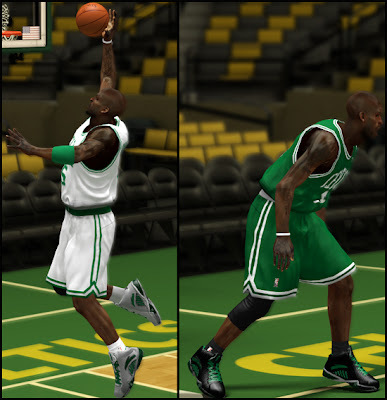 Description: This patch for NBA 2K13 converts the Nike Zoom VII shoes into Anta KG3 shoes. 2. Extract the file using WinRAR archiver. 3. Copy "shoe_111_00.iff" & "nshoe_fe_0111.iff" in NBA 2K13 game folder. • Windows 32bit - "C:\Program Files\2K Sports\NBA 2K13"
• Windows 64bit - "C:\Program Files (x86)\2K Sports\NBA 2K13"
5. Play NBA 2K13 » Go to Features » 2K Shoes » My Shoes » Nike Tab » Look for Anta KG 3 Shoes » Select and choose Equip Shoe > Go to Boston Celtics team > Assign to any player/s.